For years I’ve asserted that Amsterdam’s Schipol Airport was in a league of its own because it offered grimy passengers a hot shower and a place to brush the socks off their teeth. (You know that feeling when you haven’t brushed your chompers for a few hours and they feel fuzzy? Tooth socks, a la my flatmate Laura.) There’s also a casino for inveterate gamblers, and more than a few tulip shops with flappy wire butterflies. Fraport, despite sounding more like a Starbucks beverage than an airport, just gave Schipol a massive one-up. I arrived at Frankfurt shortly after 5:30 in the morning with 9 hours between me and my flight back to Cairo, and I wanted one thing: a shower. And some quiet rest. So two things. 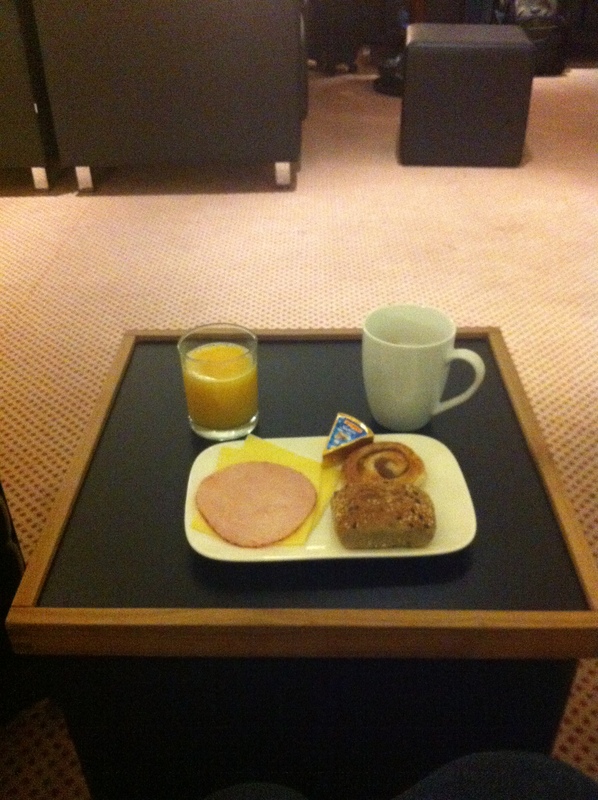 My first plan was to check out the on-site Sheraton, which offers day rooms much like Schipol’s Mercure. I knew the Sheraton was near Terminal One, but having walked for about fifteen minutes already, I thought it best to inquire. I asked a woman wearing an official-looking suit where I might find the hotel. “No…I don’t think I need one…” I think for a second. I am sure I don’t. I was just here a year ago. Two tired-looking police officers confirmed that I did NOT need a visa and pointed me in the direction of the Sheraton. A half a mile and six escalators later, I found myself in a spacious lobby whose domed ceilings reminded me of both a cathedral and the Bat Cave. A smiling receptionist told me that the cheapest day room was 130 euro, a price that, shamefully, I was considering. (I was tired. And slimy.) I sat down to check my bank account to see if I should shell out the cash – Fraport offers a pretty reliable WiFi connection, free – but found that the Sheraton, of course, had its own WiFi. I returned to the smiling woman and asked for the password. 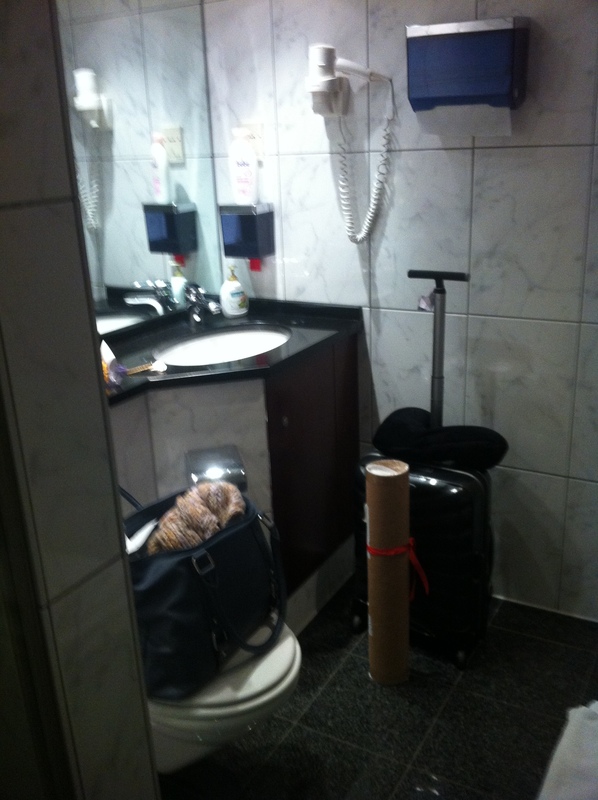 Unwilling to pay $150 for a room that did not include WiFi, I trekked back to the airport, determined to find a shower. Matthias, my handy German friend, had Googled lounge information for me prior to my trip and had sent me a link to a payable access lounge that he claimed had showers. Without WiFi, I couldn’t locate it, so I instead followed the signs labeled “Douchen” with sketches of sprinkling shower heads on them. Eventually, I found myself in a public restroom with four toilet stalls and a larger stall at the end marked “douchen.” The thought of standing barefoot in a public restroom felt repulsive (I could feel myself becoming even more physically unclean just thinking about it), so I promptly turned and exited in search of an information desk. Surely airport information could verify Matthias’ mysterious lounge claim. At the information desk, the woman apologized for not having any LuxxLounge flyers, but gave me what information she could. It was half past six, so I returned to the public toilet and stared at the stall, debating how badly I needed to clean myself and whether I’d possibly get dirtier just by taking my clothes off in the bathroom. And where would I put my suitcase and Moustafa’s painting? In a nearby stall? How would I dry myself? Deciding I smelled bad enough to be desperate, I grabbed a roll of toilet paper from a bathroom stall in lieu of a towel and turned the handle. Irritated, I made my way back to the lobby and pulled up Matthias’ message. It advertised the mythical LuxxLounge, but contrary to the Information attendant, claimed the lounge opened at 6am and had showers. Incredulous – was this an old website? – I asked an attendant how to find this place and made my way down the C corridor and up an escalator where a heavy wooden door claimed to be the gateway to LuxxLounge. A posh affair, I had to ring a bell to enter – and then I was in another world. Two very pleasant women at the desk greeted me warmly and brightly informed me that I could pay to enter the lounge and have a shower. For 30 euro, I could spend 3 hours in the lounge and indulge myself in all it had to offer: clean shower, breakfast buffet, bar (mimosas? yes please), business room, and reclining sofas. For 50 euro, I could spend as much time as I liked. It is pleasant and calm in here with plush leather sofas and a grumbling cappuccino machine. I am squeaky clean and happily blogging away. Still, I can’t help but marvel at the inexplicable misinformation on the part of the airport employees. The only plausible explanation is that they are sworn to guard the lounge’s secrecy with thinly veiled lies and a lack of flyers. Which makes the lounge even cooler. A shower where I’m not afraid to be barefoot! Back in the day when I worked for the UK government and the UK government had more money to spend I used to fly business class . Oh the luxury of the BA arrivals lounge at Heathrow. A huge shower room complete with fluffy robes, a huge range of products, hairdryers. ..then a breakfast buffet spread fit for a queen. ..ah now that I fly cattle class with kids I can only dream of those days! Fluffy robes?? I’ve never flown first class OR British Airways for that matter…now I feel like I’ll have to do both! I once got upgraded business to first miami to London. They had duvets! Your comments make me want to work for the UK government. Do they accept Americans?? Ha ha – possibly! But sadly even if they do the days of us flying business class are over 😦 I used to work for the Foreign Office – but I am just a normal civilian now. My husband still works as a crown civil servant but we are lucky to get premium economy these days. Fair enough, given all the other cuts we’ve been having in this country – I would rather spend the money on the NHS than our flights. It was VERY nice when it lasted though…. I bet. You never know! Great blog, by the way. You’ve got a neat variety of posts. Thank you! I love your name – one of my favourite books!